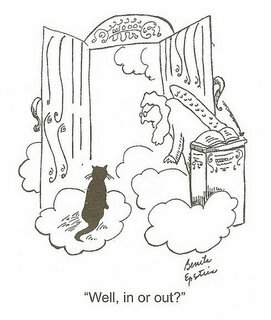 Funny Cat Heaven Pearly Gates Peter Cartoon - Well, in or out? St. Peter was manning the Pearly Gates, waiting for new souls coming to heaven, but was dying for a pee. He saw Jesus walking by and asked him, "Jesus, could you mind the gate for a minute?" Jesus thought this was easy enough and agreed to help. Peter rushed off. The first person to approach was a wrinkled old man. Jesus asked him to sit down, and peering closely at him, asked, "What did you do for a living?" Jesus remembered his own earthly existence fondly, so leaned forward and asked, "Did you have any family?" "Yes, I had a son," replied the old man, "but I lost him." "Well," said the man, "he had holes in his hands and feet." Jesus leaned forward even more and whispered, "Papa?" The old man looked at Jesus closely, a glint of recognition appearing in his faded eyes, and whispered back, "Pinocchio?"